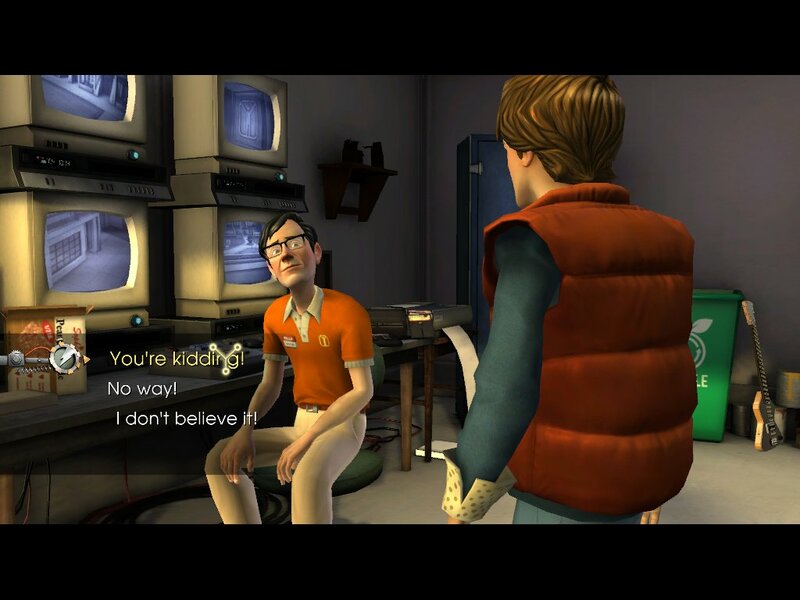 Last week, Episode 3 of Back to the Future: The Game rolled out. Telltale has really been impressing me with their ability to turn this franchise into a worthwhile adventure game, and with the ending of the previous game and the tantalizing preview it contained, I was beyond eager to try out the third installment. Now that I’ve completed it, it is time to see how it stacks up against its two predecessors. As before, this is an episode of a larger series, so the visuals are expected to have a certain degree of consistency. That is not, though, to say that they are stagnant. Far from it. Thanks to the story elements you’ll read about shortly, this game gives us yet another taste of the iconic Hill Valley town square. At first glance, you would think that it is intended to be a futuristic version, along the lines of the Hill Valley of 2015 that we see in the movie. A closer look, and a glance at the time machine’s readout, reveals that this is actually an alternate 1986. Things Orwellian, with stark, sterile architecture and clinical environments. Here and there, a big brother-esque poster or disturbingly uniformly dressed “citizen” will hint at the bizarre turn things have taken. The series staple of re-imagining the characters with the timeline is very well done this time around, too. 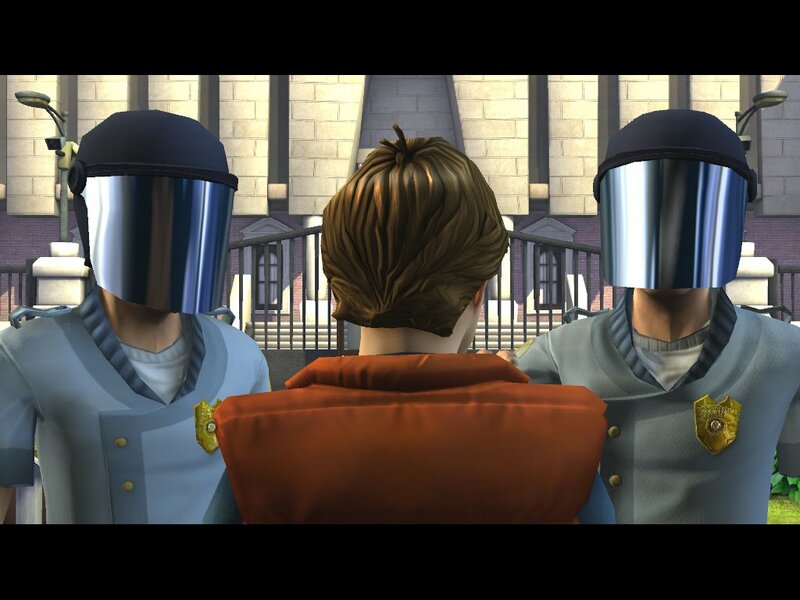 Marty’s father, for instance, is almost TOO well adjusted to the near police state he is in. His mother, on the other hand, isn’t coping as well as she might. Biff is cleaned up and fully reformed, though when discussing certain subjects with him, you can see a bit of conflict on his expression. 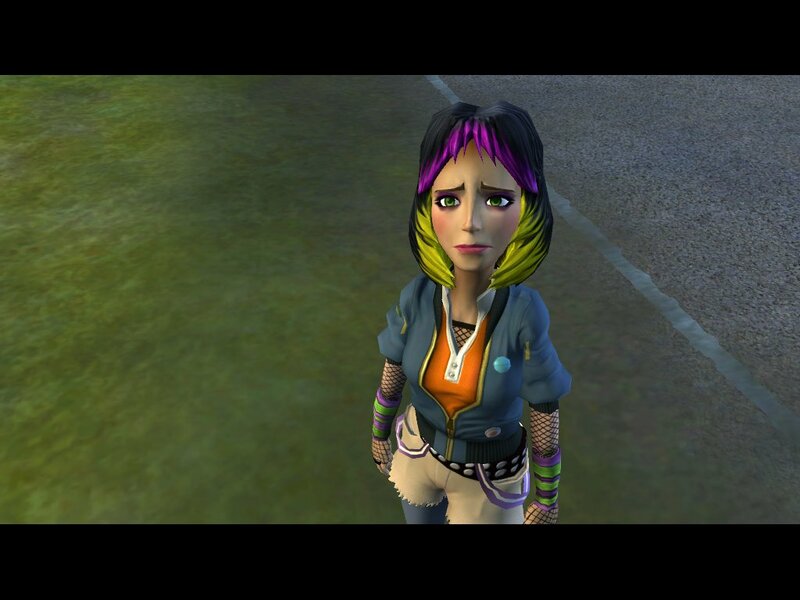 We get our first glimpse of Jennifer, Marty’s girlfriend, looking punk as can be. 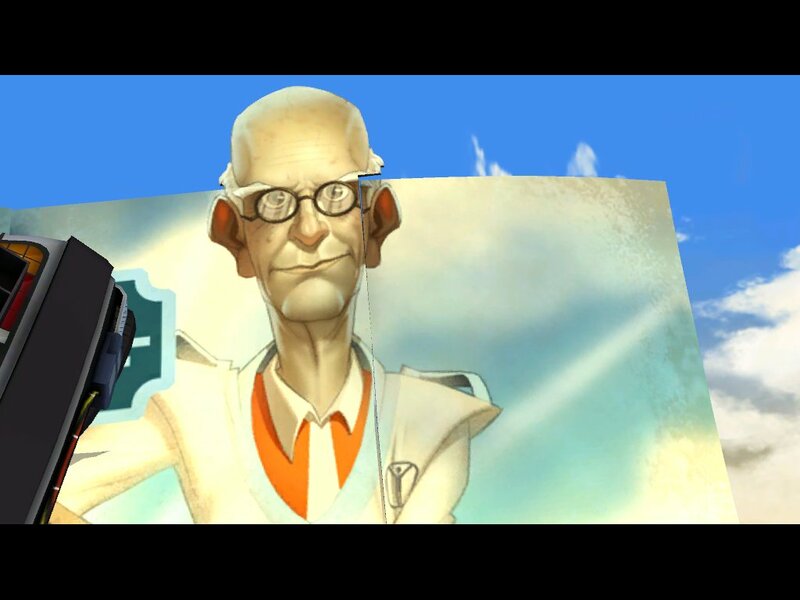 The most startling change, though, is Doc Brown, or “Citizen Brown” as he is now known. Gone is the wild mane of hair and enthusiastic eccentricity. 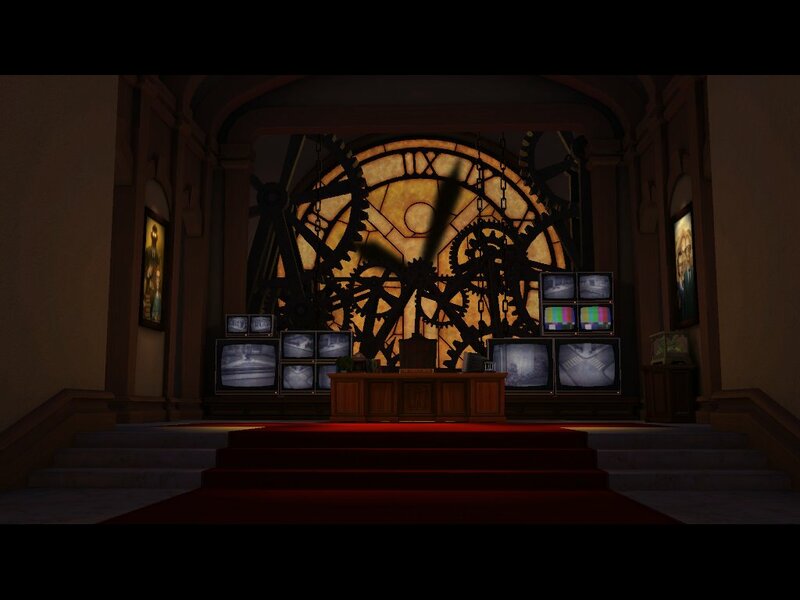 In its place is a neat, efficient mastermind, sitting in an ominous office within a renovated Hill Valley clock tower. The new setting really gave the artists a chance to stretch their limits and set the tone, and it has led to some great visuals. Why have you betrayed me, trusty city limits billboard? The gameplay is the same as the other games in the series, though I should say that this time it was a little more focused on exploration and story than on puzzle solving. This could be due to the extreme shift in setting. In the past we’ve had an entirely new setting in the prohibition era, or a slightly shifted 1986. These either were able to simply introduce new things or explain away one or two alterations. The new Hill Valley is so utterly different, a huge amount of backstory is needed to make sense of it. Thus, you will spend a great deal of time listening to historical records, walking through deep conversation trees, and generally educating yourself. I assure you, with enough back story, this is appropriate. There was a new gameplay twist or two, though. At one point you need to have a guitar showdown with a romantic rival. The two of you are evenly matched, so the only way to win is to maneuver your opponent into a mishap before he does the same for you. It reminds me of a similar puzzle from one of the Strong Bad games, also by Telltale, and it was a nice little chance of pace. I had an issue or two with the game’s puzzles, though. One puzzle, for instance, required you to nab a can of spray paint from a rebellious Jennifer. It is visible at her feet, but if you grab it, then talk to her, she’ll demand it back. Despite going through all of the usual steps to return the puzzle to its initial state, the can of spray paint never seems to come back. Finally I just tried to take it, even though I couldn’t see it, and sure enough, it was there, just not visible. One or two of the other puzzles were a little non-obvious in their solutions, but then, it wouldn’t be a puzzle game if it was obvious. I also felt as though the game was a little too short, but that’s likely due to the fact that I played it in one marathon session. Overall, the game came up a little short for me, and the heavy story telling slant might turn off some people, but I didn’t mind at all, thanks to the strength of the story. Good heavens, so many choices! There isn’t a tremendous amount to be said here that hasn’t been said about the first and second episodes. I will say that the addition to the authentically voiced Jennifer is a welcome one. Also, the severe character shift that Doc Brown undergoes gave Christopher Lloyd a chance to really show off his character acting chops. There were also a few notable lines, including the mandatory rephrasings of series quotes to pop culture references. My favorite was a Marty’s imitation of Han Solo’s pathetic “We’re all fine here. How are you?” line from Star Wars. Click on the squawk box a few times, you’ll hear it. 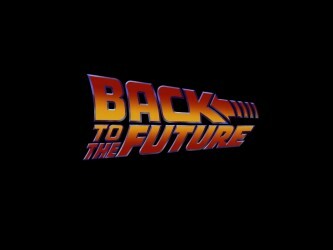 The story begins with Marty crashing the DeLorean into a billboard. 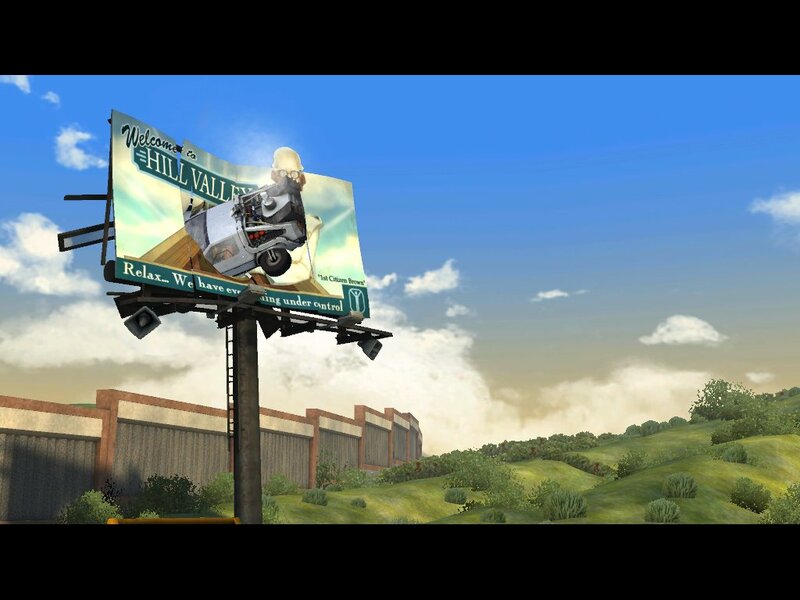 The usual procedure upon visiting a new time is to hide the time machine in a billboard on the outskirts of town. Ramming it through one is definitely a new spin. It also provides a VERY serious issue, because the time machine is completely totaled by the collision. You won’t be leaving until you can find someone to fix it, so you are forced to explore this new world in hopes of finding Doc. At first blush, one would think that Marty had ended up in 1984, not 1986. 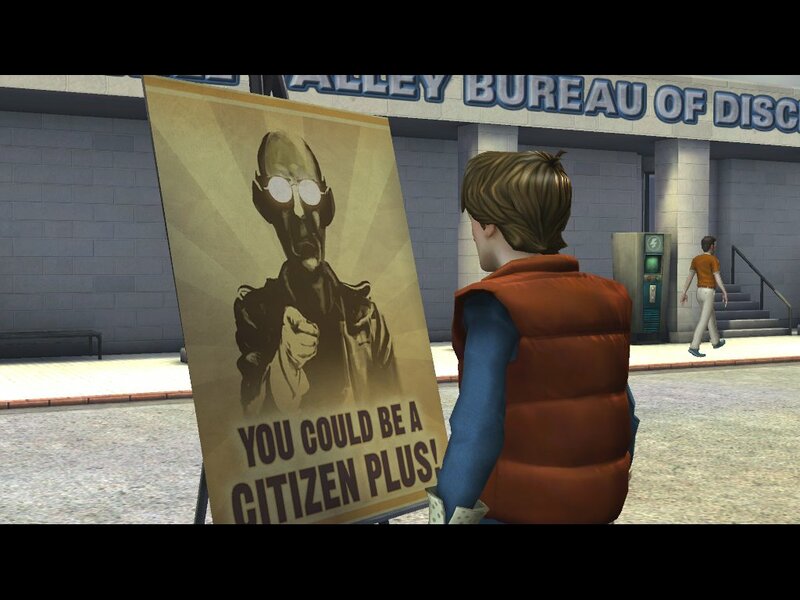 Hill Valley has become become either a crime-free utopia or a tyrannical police state, depending on who you speak to. A wall surrounds the town, and cameras watch your every move. People have begun to where daily uniforms. Name badges are mandatory. Infractions as minor as failing to recycle or hugging in public are punished with ‘Demolition Man’ style demerits, dispensed by police or by automated squawk boxes. Most alarmingly, everywhere you look, you see the cold, authoritative likeness of this timeline’s Emmett Brown. 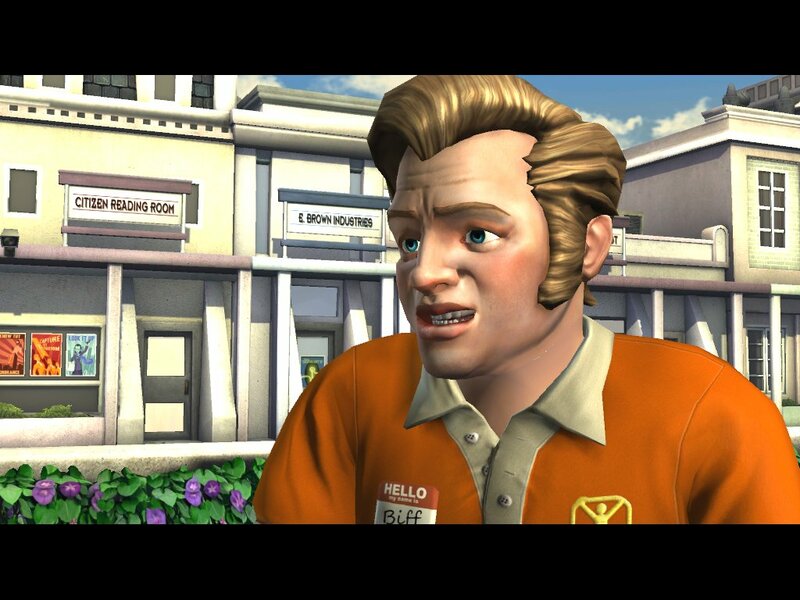 No longer ‘Doc’, now he goes by the name Citizen Brown, and he is the mayor. 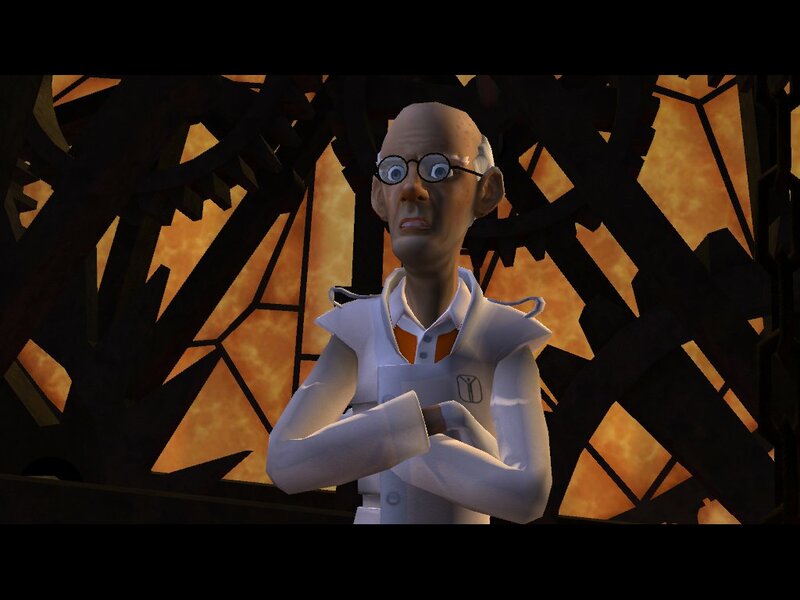 You learn the history, you find that a number of minor changes (caused by your actions in the prior episodes) have combined to completely alter his outlook, and his considerable scientific know how has been turned instead to creating this strictly controlled model city. Faceless stormtroopers: The sure sign of a properly functioning utopia. There are mentions of a ‘Citizen Plus’ program, which sounds sinister enough just in name, but seems more ominous by the moment as you learn that it is responsible for turning the bad egg that Biff should have been into a downright goody two shoes. Rather than by a lifetime of dealing with a more confident George McFly, this time Biff was neutered by mental conditioning that makes misbehavior literally sickening to him. Predictably, not everyone is pleased with the state of Hill Valley, least of all this version of Jennifer, who has become an anti-establishment outsider. This, it turns out, is fortunate, because the only way to see Doc, and thus perhaps convince him to fix the time machine and help you undo your latest botching of the spacetime continuum, is to rack up a record breaking number of demerits. 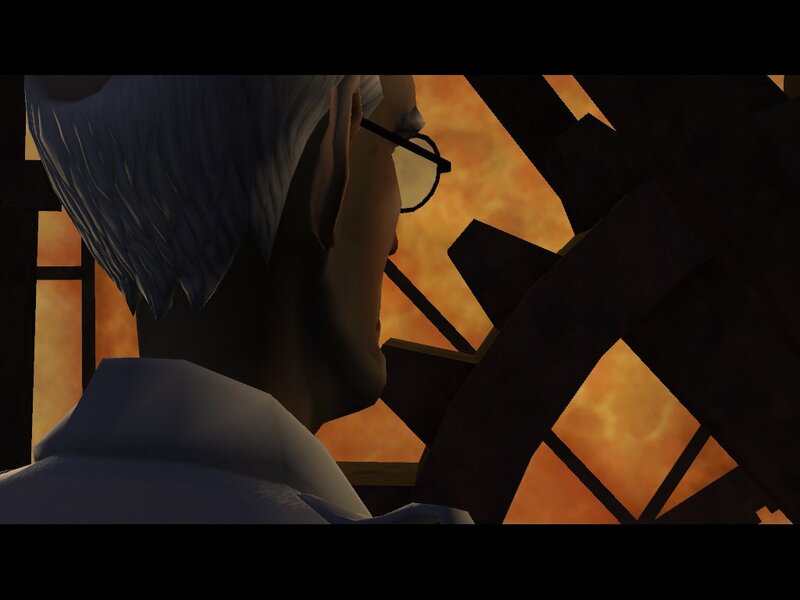 The plot of the game, and the little details sprinkled throughout do an excellent job at folding the events of the other games into a smooth and well shaped universe. 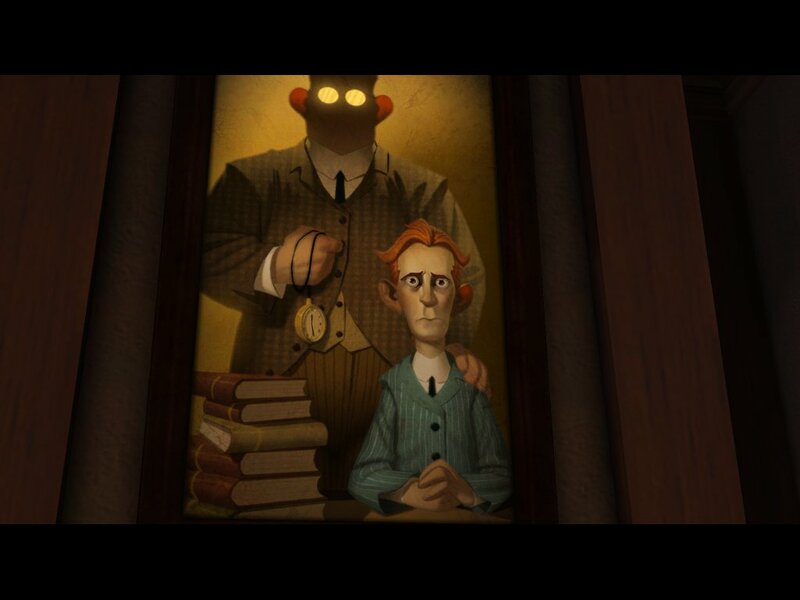 Not only that, but there was a visual cue visible almost from the very first moment of the game that managed to be an almost “Would you kindly?” level revelation for me when it was finally pointed out. Your mileage may vary on that and other parts of the plot, but overall I found it to be excellent. The gameplay slid a little bit, this time around, but taken as a whole, I think this game was an improvement over episode 2. The setting was creative and deep, and the new face of Doc Brown allowed for a little bit of dramatic range for the best actor in the cast. 9.0 / 10: A little bit story heavy, but with a story this good, it is worth it. Why have you betrayed me, trust city limits billboard? Welcome to the cast, Jennifer. Nice hair. Relax. He has everything under control. A legitimate smile if ever I saw one. Never trust a man with spectacles and white gloves.